STS indicates Society of Thoracic Surgeons; PROM, predicted risk of operative mortality; TAVR, transcatheter aortic valve replacement. In the box-and-whisker plots, the middle line is the median, the top and bottom of the box indicate the interquartile range, and the error bars are minimum and maximum values excluding outliers. Department of Health and Human Services. Correspondence regarding premarket approval application for Edwards Sapien transcatheter heart valve. November 2, 2011. http://www.accessdata.fda.gov/cdrh_docs/pdf10/p100041a.pdf. Accessed October 28, 2013. US Food and Drug Administration. FDA expands approved use of Sapien artificial heart valve. October 19, 2012. http://www.fda.gov/NewsEvents/Newsroom/PressAnnouncements/ucm323478.htm. Accessed October 28, 2013. Centers for Medicare & Medicaid Services. National Coverage Determination (NCD) for transcatheter aortic valve replacement. http://www.cms.gov/medicare-coverage-database/details/ncd-details.aspx?NCDId=355&ncdver=1&NCAId=257&ver=4&NcaName=Transcatheter+Aortic+Valve+Replacement+%28TAVR%29&bc=ACAAAAAACAAAAA%3D%3D&. Accessed November 1, 2013. American College of Cardiology; Society of Thoracic Surgeons. ACC/STS TVT Registry home page. https://www.ncdr.com/TVT/Home/Default.aspx. Accessed October 28, 2013. American College of Cardiology; Society of Thoracic Surgeons. ACC/STS TVT Registry: data collection. https://www.ncdr.com/tvt/Home/DataCollection.aspx. Accessed October 28, 2013. American College of Cardiology; Society of Thoracic Surgeons. ACC/STS TVT Registry: NCDR participants/site manager contact. https://www.ncdr.com/TVT/Private/Resources/ParticipantDirectory.aspx. Accessed October 28, 2013. Society of Thoracic Surgeons. Online STS risk calculator. http://riskcalc.sts.org/STSWebRiskCalc273/. Accessed October 28, 2013. US Food and Drug Administration. Strengthening Our National System for Medical Device Postmarket Surveillance. September 2012. http://www.fda.gov/downloads/AboutFDA/CentersOffices/CDRH/CDRHReports/UCM301924.pdf. Accessed October 28, 2013. Cardiac Interventions Today. FDA approves revised labeling to allow alternative access sites for Edwards Sapien TAVR device. September 23, 2013. http://www.bmctoday.net/citoday/2013/08/article.asp?f=fda-approves-revised-labeling-to-allow-alternative-access-sites-for-edwards-sapien-tavr-device. Accessed October 28, 2013. Importance Transcatheter aortic valve replacement (TAVR) was approved by the US Food and Drug Administration for the treatment of severe, symptomatic aortic stenosis and inoperable status (in 2011) and high-risk but operable status (starting in 2012). A national registry (the Society of Thoracic Surgeons/American College of Cardiology Transcatheter Valve Therapy [STS/ACC TVT] Registry) was initiated to meet a condition for Medicare coverage and also facilitates outcome assessment and comparison with other trials and international registries. Objective To report the initial US commercial experience with TAVR. Design, Setting, and Participants We obtained results from all eligible US TAVR cases (n=7710) from 224 participating registry hospitals following the Edwards Sapien device commercialization (November 2011–May 2013). Main Outcomes and Measures Primary outcomes included all-cause in-hospital mortality and stroke following TAVR. Secondary analyses included procedural complications and outcomes by clinical indication and access site. Device implantation success was defined as successful vascular access, deployment of a single device in the proper anatomic position, appropriate valve function without either moderate or severe AR, and successful retrieval of the delivery system. Thirty-day outcomes are presented for a representative 3133 cases (40.6%) at 114 centers with at least 80% complete follow-up reporting. Results The 7710 patients who underwent TAVR included 1559 (20%) cases that were inoperable and 6151 (80%) cases that were high-risk but operable. The median age was 84 years (interquartile range [IQR], 78-88 years); 3783 patients (49%) were women and the median STS predicted risk of mortality was 7% (IQR, 5%-11%). At baseline, 2176 patients (75%) were either not at all satisfied (1297 patients [45%]) or mostly dissatisfied (879 patients [30%]) with their symptom status; 2198 (72%) had a 5-m walk time longer than 6 seconds (slow gait speed). The most common vascular access approach was transfemoral (4972 patients [64%]), followed by transapical (2197 patients [29%]) and other alternative approaches (536 patients [7%]); successful device implantation occurred in 7069 patients (92%; 95% CI, 91%-92%). The observed incidence of in-hospital mortality was 5.5% (95% CI, 5.0%-6.1%). Other major complications included stroke (2.0%; 95% CI, 1.7%-2.4%), dialysis-dependent renal failure (1.9%; 95% CI, 1.6%-2.2%), and major vascular injury (6.4%; 95% CI, 5.8%-6.9%). Median hospital stay was 6 days (IQR, 4-10 days), with 4613 (63%) discharged home. Among patients with available follow-up at 30 days (n=3133), the incidence of mortality was 7.6% (95% CI, 6.7%-8.6%) (noncardiovascular cause, 52%); a stroke had occurred in 2.8% (95% CI, 2.3%-3.5%), new dialysis in 2.5% (95% CI, 2.0%-3.1%), and reintervention in 0.5% (95% CI, 0.3%-0.8%). Conclusions and Relevance Among patients undergoing TAVR at US centers in the STS/ACC TVT Registry, device implantation success was achieved in 92% of cases, the overall in-hospital mortality rate was 5.5%, and the stroke rate was 2.0%. Although these postmarket US approval findings are comparable with prior published trial data and international experience, long-term follow-up is essential to assess continued efficacy and safety. 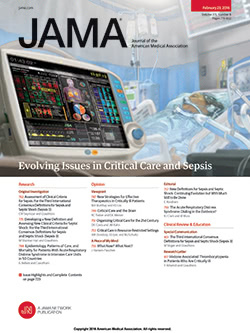 Although the pivotal PARTNER trials demonstrated efficacy of TAVR within a select cohort of patients and hospital centers, there are no data on dissemination and utilization patterns of this technology in routine clinical practice in the United States.5,6 Additionally, concerns persist regarding the safety and effectiveness of this novel technology as it moves beyond protocolized trial care and highly experienced centers and operators. In this analysis, we describe the initial US TAVR experience, including patient selection, procedural details, and in-hospital and 30-day outcomes following TAVR among patients enrolled in the TVT Registry. The STS/ACC TVT Registry was launched in December 2011 following FDA approval of the Sapien Transcatheter Heart Valve.7 The TVT Registry is a joint initiative of the STS and ACC including participation of more than 250 clinical sites (eTable 1 in the Supplement), with multistakeholder involvement on the steering and stakeholder advisory committees. The TVT Registry is responsive to the CMS National Coverage Determination (May 2012) requirement for national registry participation of all TAVR centers and is intended to serve as a platform for (1) device and procedural surveillance; (2) quality assurance and improvement initiatives; and (3) efficient conduct of device-labeling studies that will speed US access to new devices and support expansion of device labeling with evidence development. Registry activities have been approved by a central institutional review board, and the Duke University School of Medicine institutional review board granted a waiver of informed consent and authorization for this study. Participating TVT Registry centers collect information on patient demographics, comorbidities, functional status, patient-reported quality of life, hemodynamics, procedural details, and postoperative, 30-day, and 1-year outcomes.8 Data quality checks are implemented both at the National Cardiovascular Data Registry data warehouse and the Duke Clinical Research Institute Analysis Center, including data quality feedback reports and data range and consistency checks. Additionally, site training is conducted by the National Cardiovascular Data Registry through frequent informational webinars. In the case of missing data, sites have been contacted to encourage complete reporting. Data elements were collected using standardized definitions,9 which have been harmonized with the STS National Database wherever possible. The following represent several definitions of interest. The clinical indication for TAVR (inoperable or high-risk status) was based on determination by 2 experienced local cardiac surgeons using risk calculations from the STS predicted risk of operative mortality (PROM) from isolated surgical aortic valve replacement (AVR)10 and clinical judgment. The STS PROM estimates expected risk of operative mortality, with a range of 0% to 100% risk. For the purposes of this analysis, patients were considered to have high-risk but operable status if the procedure was chosen based on extreme risk (due to comorbid conditions or technical reasons) or patient preference. A hybrid operating room was defined by the registry as a procedure room with standard fluoroscopic catheterization laboratory imaging situated in an operative suite. Porcelain aorta was defined as extensive circumferential calcification of the ascending aorta precluding safe surgical entry. “Hostile chest” included medical conditions that preclude open chest procedures, including abnormal chest wall anatomy (congenital or acquired), extensive mediastinal radiation, complete absence of sternal reconstructive options based on plastic surgery consultation, or other anatomical reasons to consider repeat sternotomy or right anterior thoracotomy prohibitively hazardous. Gait speed was defined as slow if the reported 5-m walk time was longer than 6 seconds.11 The 12-question Kansas City Cardiomyopathy Questionnaire (KCCQ-12) has been validated12 and is available online through the TVT Registry data coders dictionary. Both in-hospital and 30-day outcomes were site-reported to the TVT Registry using standardized definitions, including harmonization with Valve Academic Research Consortium (VARC) and VARC-2 definitions for stroke, transient ischemic attack, aortic valve reintervention, major bleeding, and major vascular complications.13,14 All site-reported stroke, transient ischemic attack, and valve reintervention events were adjudicated by a board-certified cardiologist using a combination of site-reported clinical information and targeted chart reviews. Device implantation success was defined as successful vascular access, delivery and deployment of a single device in the proper anatomic location, appropriate performance of the prosthetic heart valve (aortic valve area >1.2 cm2 and mean aortic valve gradient <20 mm Hg or peak velocity <3 m/s, without moderate or severe prosthetic valve aortic regurgitation), and successful retrieval of the delivery system. Aborted procedures were defined as those that were cancelled or terminated after the patient entered the procedure room. Incident renal failure included a new post-TAVR requirement for hemodialysis or increase in serum creatinine level to 3.0 mg/dL or higher. Thirty-day outcomes are reported among patients with a known 30-day status among the hospitals with 80% or higher 30-day follow-up for each of the primary and secondary outcomes of interest (death, stroke, incident dialysis-dependent renal failure, and aortic valve reintervention), beginning with prospective TVT Registry data collection on May 1, 2012. Thirty-day follow-up status was considered to be known for cases that involved in-hospital death, death within 30 days of the index procedure, or no death within 30 days of the index procedure but affirmation that the patient was alive (with or without an adverse event) within the 30-day follow-up window (25-75 days following the index procedure). Baseline characteristics and in-hospital outcomes for patients with vs without 30-day follow-up are presented in eTable 2 in the Supplement. Patient- and case-specific results were summarized and reported as medians and interquartile ranges (IQRs). Confidence intervals were calculated using exact 95% binomial confidence limits for key in-hospital and 30-day outcomes. Descriptive statistics are stratified by risk status (inoperable/high risk) and access site; however, statistical comparisons were not performed because of a lack of adequate comparator groups. The median STS PROM was calculated for each hospital center using the STS isolated surgical AVR risk algorithm and variables reported to the TVT Registry and shown as a function of center-level TAVR volume (Figure) evaluating the relationship between observed center-level variation in patient selection and procedural volume, with the hypothesis that a larger proportion of low-volume centers would select lower-risk TAVR cases. In the Figure, each dot represents an individual center and the median PROM is the median predicted risk for patients at each center. Although the STS PROM for surgical isolated AVR may not be an accurate predictor of TAVR risk, it does provide a uniform summary statistic for assessing baseline case complexity. SAS statistical software version 9.1 (SAS Institute Inc) was used for all calculations, and analyses were performed at the TVT Registry Analysis Center at the Duke Clinical Research Institute. There were 8075 TAVR cases entered into the TVT Registry between November 1, 2011, and May 31, 2013, allowing 60 days for data entry. Among these patients, 292 cases had missing data for in-hospital events, discharge status, or valve sheath access site; in addition, in 73 cases the operator assessment of procedural risk (either inoperable or high risk) was unknown. The baseline characteristics and in-hospital outcomes of these 365 patients are documented in eTable 3 in the Supplement. These patients were excluded from the primary analysis, leaving 7710 TAVR procedures from 224 hospitals. There were 2911 patients in whom KCCQ-12 data were available and 3065 for whom 5-m walk times were available. These patients were included in a secondary analysis. Characteristics of patients with vs without complete data for the KCCQ-12 and 5-m walk test are also presented in eTable 3. Among the 7710 patients undergoing TAVR, the median age was 84 years (IQR, 78-88 years) and 51% % were male (Table 1). The median calculated STS PROM was 7% (IQR, 5%-11%), with considerable site-level variation (median site-level PROM ranged from 1.2% to 17.4%, including all centers; the Figure shows results for centers with 10 or more cases). Documentation of preoperative evaluation of a patient’s suitability for surgical AVR by at least 2 cardiac surgeons was reported in 91% of cases (n = 7020). A total of 1559 patients (20%) were considered to have an inoperable status and 6151 patients (80%) were considered at high operative risk (multiple comorbidities, 59%; severe deconditioning/debilitation, 17%; other, 4%). Markers of increased risk with surgical AVR were common: 7% with a left ventricular ejection fraction of 30% or less (n = 540), 13% with a previous stroke (n = 1004), 5% with dialysis-dependent renal failure (n = 350), 28% with moderate/severe chronic obstructive pulmonary disease (n = 2145), and 15% with oxygen-dependent lung disease (n = 1135) (Table 1). “Hostile chest” was reported in 10% (n = 742), 1 or more prior cardiac surgeries in 32% (n = 2445), and a porcelain aorta in 8% (n = 587). Patients in this cohort had a high burden of advanced heart failure, with severe functional limitations. Prior to the TAVR procedure, more than 81.3% had New York Heart Association class III/IV heart failure symptoms (n = 6272). Among the 3065 patients for whom a 5-m walk test results was reported, a slow gait speed was present in 2198 patients (72%) (median time, 8 seconds; IQR, 6-11 seconds). Among the 2911 patients for whom KCCQ-12 results were available at baseline, 763 (26%) were “quite a bit” or “extremely” limited in their ability to shower or bathe, 1524 (52%) had similar limitations with walking on level ground, and 2042 (70%) had similar limitations with hurried activities. A majority said that they would be mostly dissatisfied (1297 patients [30%]) or not at all satisfied (879 patients [45%]) if their remaining life were spent with a similar degree of symptoms. Transcatheter AVR was performed for degenerative aortic stenosis in 7090 patients (92%), with a median aortic valve area of 0.6 cm2 (IQR, 0.5-0.8 cm2). Among those with reported pre-TAVR mitral valve function data (n=6528), mitral valve insufficiency was none/trace in 1015 (16%), mild in 3129 (48%), moderate in 2037 (31%), and severe in 347 (5%). A total of 4391 procedures (57%) were performed in hybrid operating rooms, 2165 (28%) in hybrid catheterization laboratories, and 1050 (14%) in standard catheterization laboratories; general anesthesia was used in 7565 cases (98%) (Table 2). The most common approach was transfemoral (4972 cases [64%]), followed by transapical (2197 cases [29%]) and other approaches (536 cases [7%]); percutaneous access was used in 1792 transfemoral cases (36%). In patients with inoperable status, 420 (27%) procedures were performed by a “nontransfemoral” approach, an off-label use of the TAVR device. Device implantation success for the transcatheter valve was achieved in 7069 cases (92%; 95% CI, 91%-92%); among those without a prior transcatheter or surgical AVR, 2 or more valves were used in 2.9%. Intraprocedural death was uncommon (0.8%); however, conversion to open-heart surgery (94 cases [1% of total]) was associated with a 49% incidence of in-hospital mortality (46 deaths). The most common causes of open-heart conversion included dislodged valve (22 cases), ruptured annulus (13 cases), ruptured ventricle (11 cases), and aortic dissection (12 cases). Overall, 94.5% of patients (n=7283) survived to hospital discharge (in-hospital mortality, 5.5%; 95% CI, 5.0%-6.1%) (Table 3). Major in-hospital complications included stroke (2.0%; 95% CI, 1.7%-2.4%), major vascular injury (6.4%; 95% CI, 5.8%-6.9%), acute renal insufficiency (5.5%; 95% CI, 5.0%-6.0%), and major bleeding (3.5%; 95% CI, 3.1%-3.9%). New-onset atrial fibrillation was observed in 6.0% (95% CI, 5.5%-6.5%) and need for new pacemaker or implantable cardioverter-defibrillator in 6.6% (95% CI, 6.1%-7.2%). Patients with inoperable status or who had a nontransfemoral procedure experienced a higher incidence of most adverse events compared with those with operable status and transfemoral procedures. Median intensive care unit stay was 46 hours (IQR, 25-77 hours), and median hospital stay was 6 days (IQR, 4-10 days). The majority of patients were discharged either to home (n=4613 [63%]) or to a rehabilitation facility (n=2134 [29%]). Among the 5979 patients with an immediate pre–hospital discharge echocardiogram, moderate or severe aortic insufficiency was observed in 508 patients (8.5%); moderate in 481 (8%), and severe in 27 (0.5%). Among patients with available baseline and post-TAVR echocardiogram results (n = 4918), the degree of mitral regurgitation was reduced in 2402 (49%), unchanged in 1962 (40%), and worsened in 554 (11%). Thirty-day outcomes data are reported from 114 hospitals (51% of the 224 hospitals in the registry) with 80% or higher 30-day follow-up for each of the primary and secondary outcomes of interest (death, stroke, incident dialysis-dependent renal failure, and aortic valve reintervention). These 114 hospitals enrolled 3528 patients, and follow-up data were not available for 395 patients (eTable 2 in the Supplement). Among the 3133 patients for whom 30-day outcome data were available, the incidence of death was 7.6% (95% CI, 6.7%-8.6%), including 52% with a noncardiovascular cause (Table 4). Stroke occurred in 2.8% (95% CI, 2.3%-3.5%), incident hemodialysis in 2.5% (95% CI, 2.0%-3.1%), and aortic valve reintervention in 0.5% (95% CI, 0.3%-0.8%). Among patients with available follow-up, the incidence of class III/IV heart failure during follow-up was 12% (compared with 81% at baseline). Overall, there were no major differences between patient characteristics and mortality outcome for patients enrolled at the 114 hospitals with 80% or higher follow-up and patients enrolled at the 110 hospitals with lower than 80% complete 30-day follow-up (eTable 2 in the Supplement). In-hospital transfemoral mortality rates were 5.4% and 3.8% in the inoperable and high-risk groups (30-day rates, 6.7% and 5.0%), comparable with PARTNER trial as-treated 30-day mortality rates of 5% and 3.7% in the same cohorts, respectively. The observed in-hospital mortality rates in the nontransfemoral cohort of 7.1% and 8.2% (30-day rates, 12.6% and 10.8%) for inoperable and high-risk status were slightly higher than the mortality rate of 8.7% in the PARTNER Trial, which was studied only in the high-risk, operable population. Vascular and bleeding complications were relatively uncommon despite this early experience and the availability of only early-generation, larger-sheath-size delivery systems in this country. Based on experience outside of the United States, vascular and bleeding complications appear to decrease with smaller-caliber, next-generation delivery system availability. A number of factors are related to the overall US outcomes reported in this analysis. First, there was already a broad experience with the device and procedure outside of the United States, which has been readily shared with US centers. Exploiting this global experience through international collaboration and common learning may well have shortened the US “learning curve.” Second, at least 35 centers had significant experience with the procedure from participation in the PARTNER trial, which benefitted not only those centers but contributed to the shared learning that may have helped all centers. Third, the device manufacturer had an education program in place with mandated training in all aspects of patient selection, procedure performance, and postprocedure care. Company-employed clinical specialists were present during all procedures. Fourth, the presence of a national registry, with explicitly planned reporting of outcomes, may have resulted in a Hawthorne or observational effect, as has been seen with other registry experiences. Fifth, compared with immediate and broad introduction of medical devices on regulatory approval, the “rational dispersion” of this new technology may have been a factor in the outcomes achieved. Sixth, the risk profile of patients reported here is generally lower (inoperable, median, 7% [IQR, 4%-10%]; high-risk but operable, median, 7% [IQR, 5%-11%]) than that seen in randomized trials and in the reports from outside the United States. Patients with inoperable status in the PARTNER trial had a mean STS PROM of 11.2% (SD, 5.8%) and those with high-risk but operable status had a mean of 11.8% (SD, 3.3%). Although this may represent incomplete entry of variables into the risk calculator by US clinical sites, it could indicate “risk creep,” meaning patients with lower surgical risk are being treated in the United States, leading to better outcomes with TAVR. However, several potential limitations should be considered in the interpretation of the results of this analysis. First, although there was an attempt to capture all TAVR procedures in the United States, not all cases have yet been entered into the TVT Registry since the issuance of the National Coverage Determination. By comparison with the Edwards Lifesciences record of procedures, it is estimated that this report represents approximately 88% of the procedures performed between the issuance of the National Coverage Determination (May 2012) and the end of the study interval (May 2013). It is likely that the early rolling enrollment of centers in the TVT Registry and an incomplete retrospective case capture has led to this discrepancy; however, it is unclear whether this underreporting is more prevalent among cases with poor outcomes. This could potentially limit generalizability of the results, although the vast majority of US TAVR cases are included in the current report, and other comparisons of missing vs complete case risk profiles and in-hospital outcomes do not suggest selective reporting of results (eTable 3 in the Supplement). Second, the 30-day outcomes presented here are limited to a subset of centers and patients (eTable 2 in the Supplement). As analysis of missing vs complete cases does not suggest biased case reporting, similar outcomes were observed in those with and without 30-day data available, indicating that these outcomes most likely are generalizable. Subsequent reports from the TVT Registry will address more complete long-term (30-day and 1-year) outcomes, including survival and patient health status, to have a more comprehensive assessment of the outcomes of patients undergoing TAVR in the United States. Third, there has been limited capture of patient health status and functional status follow-up data in the TVT Registry to date. As this became apparent during the early stages of the registry rollout, a robust site education program addressed the collection of this data at both baseline and follow-up. Subsequent reports will focus on health status and quality-of-life outcomes. Among the 7710 patients undergoing TAVR at 224 sites in the STS/ACC TVT Registry, device success was achieved in 92% of cases, with a 5.5% incidence of in-hospital mortality and a 2% incidence of stroke. Although procedural complication rates were relatively low, within the first 30 days most deaths remained noncardiovascular in nature. These findings are comparable with prior published randomized trial and international registry experience. Longer-term follow-up is essential to assess continued safety and efficacy as well as patient health status. Corresponding Author: Michael J. Mack, MD, Baylor Health Care System, 1100 Allied Dr, Plano, TX 75093 (michael.mack@baylorhealth.edu). Author Contributions: Dr Brennan had full access to all of the data in the study and takes responsibility for the integrity of the data and the accuracy of the data analysis. Study concept and design: Mack, Brindis, Carroll, Edwards, Grover, Shahian, Tuzcu, Rumsfeld, Hewitt, Michaels, Christensen, Holmes. Acquisition of data: Carroll, Edwards, Hewitt, Shewan, Michaels, Christensen, Holmes. Analysis and interpretation of data: Brennan, Brindis, Carroll, Edwards, Grover, Shahian, Tuzcu, Peterson, Rumsfeld, Hewitt, Shewan, Christian, O’Brien, Holmes. Drafting of the manuscript: Mack, Brennan, Brindis, Carroll, Edwards, Holmes. Critical revision of the manuscript for important intellectual content: Mack, Brindis, Carroll, Grover, Shahian, Tuzcu, Peterson, Rumsfeld, Hewitt, Shewan, Michaels, Christensen, Christian, O’Brien, Holmes. Statistical analysis: Carroll, Edwards, Peterson, Christian, O’Brien, Holmes. Obtained funding: Carroll, Hewitt, Holmes. Administrative, technical, or material support: Carroll, Hewitt, Shewan, Michaels, Christensen. Study supervision: Mack, Grover, Shahian, Hewitt, Christensen, Holmes. Conflict of Interest Disclosures: All authors have completed and submitted the ICMJE Form for Disclosure of Potential Conflicts of Interest. Dr Grover reports support for travel to meetings from the ACC and STS. Dr Peterson reports consultancy for Janssen, Boehringer Ingelheim, and Sanofi. Dr Shahian reports support for travel to meetings from the STS. No other disclosures were reported. Funding/Support: This study was funded by the American College of Cardiology Foundation and the Society of Thoracic Surgeons. Role of the Sponsor: The study was designed and performed by the steering committee of the TVT Registry, which is a joint partnership of the STS and the ACC Foundation. Employees of both organizations sit on the steering committee. The budget was funded out of the general operating funds of the TVT Registry. The STS and ACC Foundation otherwise had no role in the design and conduct of the study; collection, management, analysis, and interpretation of the data; preparation, review, or approval of the manuscript; or decision to submit the manuscript for publication. Disclaimer: Dr Peterson, an associate editor for JAMA, was not involved in the editorial review of or the decision to publish this article. Correction: This article was corrected on November 19, 2013, to correct the name of the device in the abstract and an incorrectly indented row stub in Table 3.